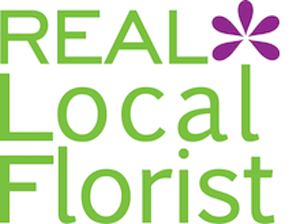 Get the most advanced Florist POS! Access from any computer with an easy to use interface. Are you tired of paying for costly hardware upgrade? Tired of having to maintain multiple databases, one for your website, one for your POS system? Antiquated POS systems are hard to navigate and lack functionality to cope with modern e-commerce transactions. 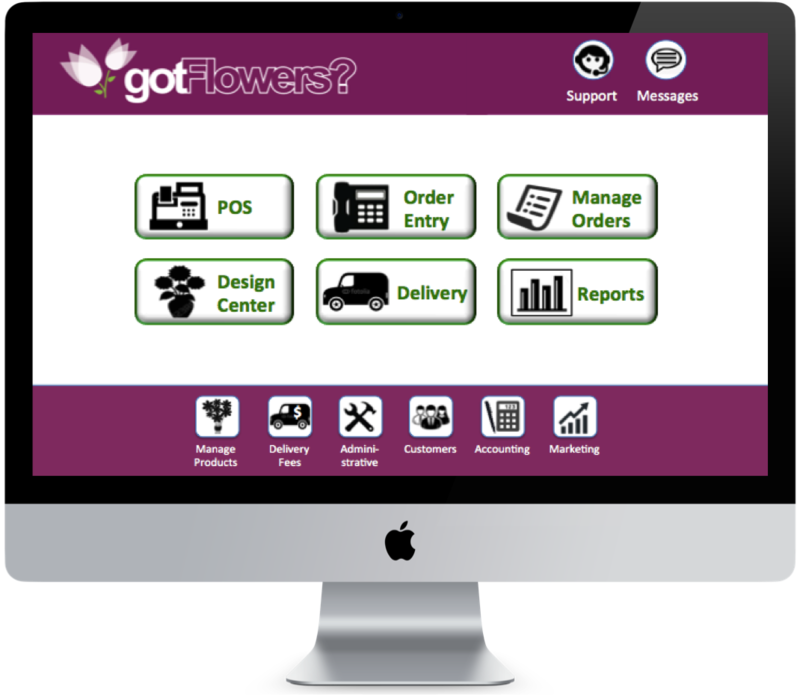 With the GotFlowers POS, you will never have to upgrade your software again. Our cloud based service provides continuous back up and access to the latest technologies. You will never have to worry about losing your data. With a unified, cloud based platform, a single set of business rules, products and prices drive multiple sales channels including the POS, website and mobile app, eliminating the need to manage each sales channel independently. One of the main goals of the GotFlowers platform is to enable florists to be more profitable with each order. We offer a suite of unique features to reinforce this goal. One of such features is “distance based delivery fees”. This feature is available on both the website and the POS system. We also offer an iPad version of the POS. This mobile POS can be used as a mobile kiosk to take orders anytime and anywhere such as farmers markets, malls, schools, or other special events. 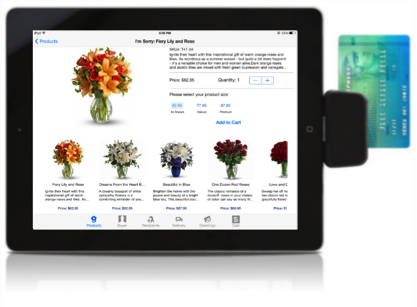 Easy to Use – GotFlowers POS deploys the latest point-and-click and touch-based technologies and makes them available through a highly intuitive user interface. No longer will you have to deal with antiquated POS systems with hard to use function keys and menu screens. Take Orders from Anywhere – In addition to the desktop POS, we also offer an iPad-based POS. With it you can open up a virtual shop, mobile kiosk and take orders anywhere, at any time. Choose any Credit Card Processor – We support payments via PayPal and Authorize.net. You will have to sign for a business account at PayPal and a Payment Gateway account at Authorize.net. GotFlowers partners with Authorize.net. You can choose any Merchant Processor for credit transactions as long as they interface with Authorize.net. Both PayPal and Authroize.net provide a PCI Compliant environment for credit card transactions. For more information, please visit PayPal PCI Compliance Information and Authorize.net and PCI compliance. Amazon Web Services (AWS) and GotFlowers – Our services are hosted on Amazon Web Services. We rely on their PCI compliant service. Read more at AWS PCI Compliance FAQ. 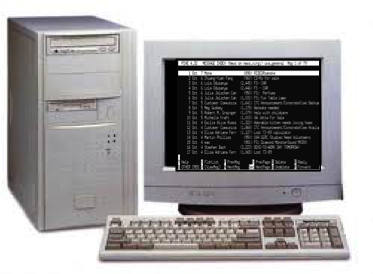 No more costly hardware and software upgrades – You can run all of GotFlowers products on your existing hardware, but you will always be using the latest software. Access Data from Anywhere – With our superior architecture, you can access your data from anywhere at anytime. Want to make a change to your website? Want to issue a promo code? Want to do that at 2AM ? No problem. Ease of Website Management – With an easy-to-use Admin dashboard, you can change the look, content and the behavior of your website with just a few clicks. No knowledge of web programming or expertise is required. And any changes you make on the Admin dashboard is immediately seen on your website. Automated Printing – Get automated prints for web orders, invoices, receipts and enclosure cards. Use your existing John Henry stationery. Incremental Orders and Partial Refunds – Edit orders to add additional products and process incremental charges or to issue a partial refund directly from the POS. Save Credit Card Information – A buyer’s credit card information can be saved for future transactions and standing orders. Information is saved conforming to PCI requirements. Multiple Recipients – Create a single order with multiple recipients with a single payment transaction. Split Payments – Process payment transactions using multiple Credit Cards, Cash or cheques. Address Verification – A customer’s address is verified during the order entry process. Multi Lingual Card Messages- Get card messages in multiple languages such as Spanish, French, German, Chinese, Japanese. Deliver sentiments in your buyer’s preferred language.